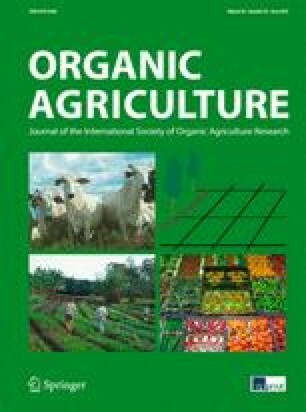 Very limited information is available on the impacts of organic farming practices on the chemical composition and properties of dairy manure. In this study, we found the differences in the absorptivities of dissolved organic matter between conventional and organic dairy manure samples at 254 and 280 nm, reflecting the difference in aromaticities of dissolved organic matter of the manures. The 13C nuclear magnetic resonance (NMR) characteristics of triple peaks around 30 ppm were more evident in organic samples than in conventional dairy manure samples. This observation was presumably due to more forage feedstuff used in organic dairy farms as this spectral feature was assigned to cutin and cutan from the outer cuticle of herbaceous plants. Thus, the distinct NMR feature of manure around 30 ppm, if further confirmed, can serve as a traceable forage marker to evaluate the authenticity of organic dairy farming programs. Mention of trade names or commercial products in this publication is solely for the purpose of providing specific information and does not imply recommendation or endorsement by the US Department of Agriculture. USDA is an equal opportunity provider and employer.